Silent Sam soon may return to campus after the UNC-Chapel Hill Board of Trustees approved a recommendation to rehouse the Confederate memorial in a new, on-campus historic education center near UNC Medical Center. The Board of Trustees met Monday, Dec. 3, to approve a recommendation to determine Silent Sam’s fate, months after protesters toppled the statue. “We do want to get this right, and we believe we have,” UNC-Chapel Hill Chancellor Carol Folt said. 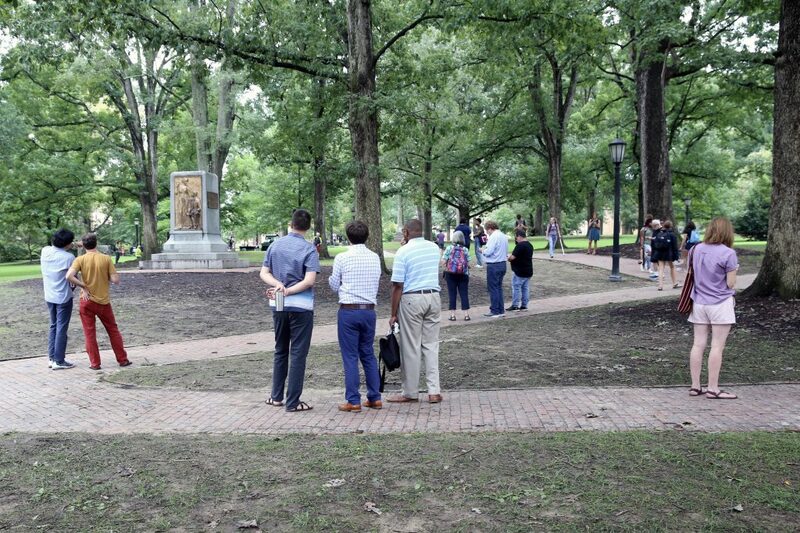 The statue — built in 1913 to honor UNC students who fought in the Civil War — was taken down by protesters Aug. 19 and put in storage by university officials. A week later, the UNC Board of Governors gave the UNC-Chapel Hill board 90 days to develop a lawful and lasting plan to restore and preserve Silent Sam. The UNC board later got an extension until Dec. 3 to complete the plan and submit it to the Board of Governors for consideration. UNC-Chapel Hill officials spent weeks deciding what to do with Silent Sam. They had to balance the demands of state law with the needs of the campus. While several board members and Folt first preferred moving the statue off-campus, current law prevents that action without legislative approval. Instead, Folt detailed a four-part plan to preserve the statue and provide historical context, while also ensuring public safety on campus. Silent Sam won’t return to its pedestal at the university’s McCorkle Place, but it could move indoors. The university plans to open a new center for history and education at Odum Village, where the statue will be available for public viewing or other educational purposes. “As you go through the law, as you go through the resolution of the Board of Governors, as you go through the resolution of our Board of Trustees, we believe that an on-campus, indoor location … is an appropriate measure to preserve the monument and is completely consistent with the governing law,” Mark Merritt, the university’s legal counsel, said. The project will cost $5.3 million to complete with an additional $800,000 in annual operating costs. It will feature state-of-the-art security measures, interactive exhibits, and teaching materials. The plan also calls for creating McCorkle Place Gateway, a commemorative space for reflection on the university’s past, present, and future with plaques and historical markers. The only board members dissenting from the plan were Allie Ray McCullen and student member Savannah Putnam. Odum Village, south of the Dean Smith Center and the main UNC Health Care campus, was built in the 1960s as apartments for graduate students and students with children. The apartments were demolished in 2016. The property hasn’t been used since. UNC System Board of Governors Chair Harry Smith released a statement in response to the recommendation. The UNC BOG will discuss the recommendation during its Dec. 14 meeting and decide whether to approve the plan. The N.C. Historical Commission will also have to sign off on the recommendations. Gov. Roy Cooper, in Greensboro on Monday for the N.C. Farm Bureau Convention, weighed in on the recommended plan for Silent Sam. “I believe those monuments should not be in a place of honor, but should be studied as a part of history in a museum,” Cooper said.